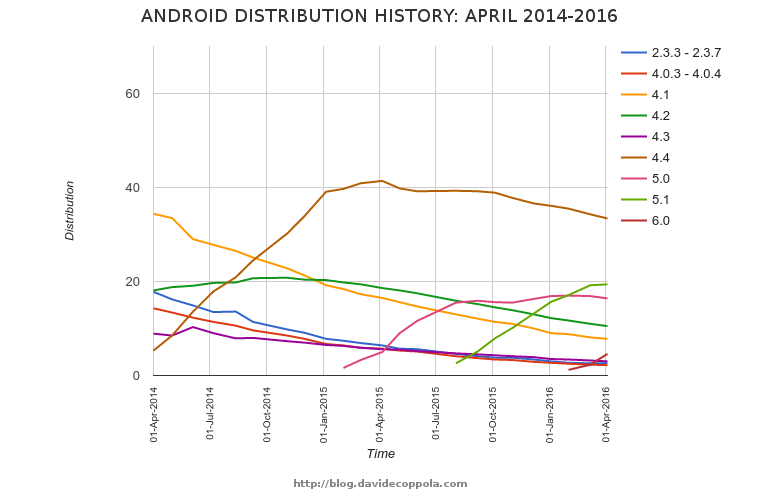 First update of the year 2016 for my series of posts dedicated to tracking and analysing the Android version distribution over time. 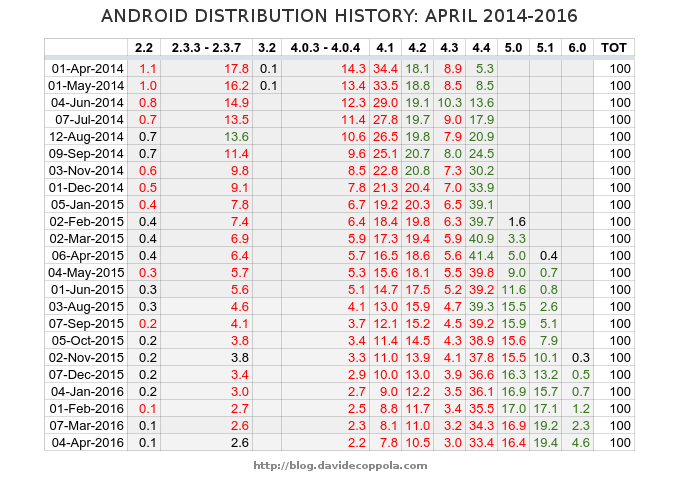 The time frame considered in this update covers the last 2 years of Android: April 2014 to April 2016. As you may have noticed, numbers in red are used when a version of Android has lost distribution share respect the previous month, whereas green numbers represent a growing distribution share. I should probably point out that since August 2013 this data is gathered from the new Google Play Store app, which supports Android 2.2 and above, devices running older versions are not included, but at that time they accounted for about 1% of devices that checked in to Google servers which probably means now they represent less than 0.1% of the Android market. Version 2.2 (Froyo) is probably living its last months at 0.1 before disappearing. Probably you’re not going to find it in my next update. Version 2.3.3 – 2.3.7 (Gingerbread) kept losing market share even slower in the last 2 months, that’s probably due to all the old low-end Android devices still using it. Version 4.0.3 – 4.0.4 (Ice Cream Sandwich) keeps having a lower market share than Gingerbread and will probably disappear sooner. Version 4.1 (Jelly Bean) is now losing market share at a much slower rate, comparable to Ice Cream Sandwich. Version 4.2 (Jelly Bean) is losing about 0.5% of market share every month, but it’s still above the 10% mark. Version 4.3 (Jelly Bean) is slowly declining in a similar fashion as 4.1. Version 4.4 (KitKat) keeps losing about 1% of market share per month, but it’s still the single most used version of Android and it will be probably until the end of the year. Version 5.0 (Lollipop) has only recently started to decline again in favour of 5.1 and Marshmallow. Version 5.1 (Lollipop) has been growing at an average rate of 2% per month until March, but in the last month has gained only a tiny 0.2% compared to the previous month, which means it probably won’t grow much furhter. Version 6.0 (Mashmallow) has finally passed the 1% mark after being out for 4 months, but at the time of writing has not passed the 5% yet. 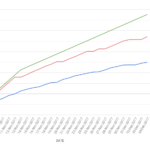 This is a pretty slow growth for a major release. To have a better visual understanding of the data I have also created a graph of the evolution of the 9 main versions over the past 2 years. 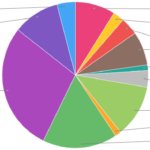 These are the Android versions with more than 1% of market share which overall cover 99.9% of the current Android market. The left axis represents the distribution percentage of a version respect the whole market, whereas the horizontal one is the time. As you might notice, Kit Kat is still the most single used Android version with a 33.4% of market share, whereas if considering different minor versions combined the winner is Lollipop with 35.8% of the Android market. Starting from this year I decided I am going to publish a new update every 4 months, for a total of 3 total updates per year. Which means you can expect the next one in August 2016. To get updates about my future posts you can follow me on Google+, Linkedin or Twitter. Feel free to share this post if you find it interesting and or useful. For any question or suggestion leave a comment below.